Create a custom RGB AOV. Use aiWriteColor to write the object mask to the custom AOV. The Input color of the aiWriteColor is the mask color, and you have to enable Blend to get the opacity blended into the Input. 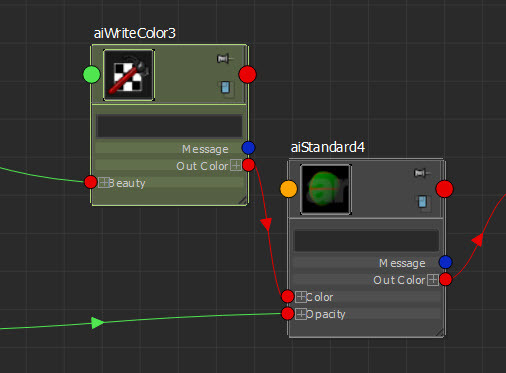 Connect the Out Color of the aiWriteColor to the Color of a Standard shader. That sends the aiWriteColor beauty to the Standard. Make sure Enable AOV Composition is turned on in the Render Settings. I don’t think this set up works if you plug a Standard into the beauty of the aiWriteColor (eg Standard > aiWriteColor > Standard). With that set of connections, I could never get the opacity right in both the Beauty and the Mask AOVs. This entry was posted in AOVs, Arnold, Maya, MTOA, Rendering and tagged AOVs, Masks, Opacity by xsisupport. Bookmark the permalink. 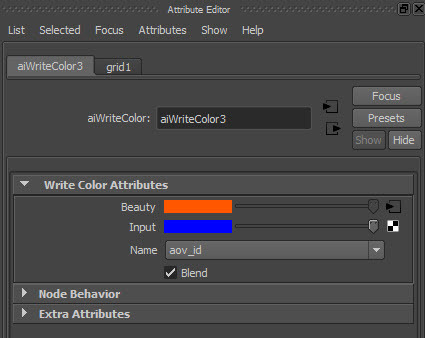 When i connect my original aiStandart1.outColor to aiWriteColor1.beauty and aiWriteColor1.outColor connect to other aiStandart2.color and assign(aiStandart2) to model – final beauty is much darker than original(aiStandart1)? What’s the problem? Or i doing(understand) something wrong? Can you give me ideas about how doing this in Softimage?